Here at DeansCards.com, we have hundreds of autographed cards and even a few baseballs. Unlike regular baseball cards, autographed cards have a human element to them that can make them more difficult, but also more fun, to collect. There is a wide array of autographed cards that range from high-quality penmanship to scribbles. 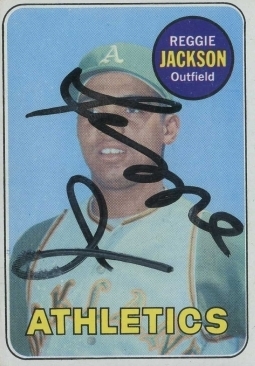 One of our least favorite autographed cards came from the 1969 Topps baseball autographed set. Dean has been hard at work getting as much of this set autographed, but the vast majority of cards came already autographed from a private collectors. In this case, Reggie Jackson signed over his own face on his rookie card. This card has been PSA/DNA certified, but it is still incredibly entertaining to see a signature directly on the most important part of a baseball card. The office favorite is probably this 1967 Topps #423 Fence Busters card featuring Willie Mays and Willie McCovey. At the time this card was issued, Mays had been playing for 16 years, while McCovey had been in the league for about 8 years. In 1966, they hit almost an identical number of home runs (Mays had 37, McCovey had 36). Although Mays' signature is a bit smeared, it still has his easily distinctive signature. 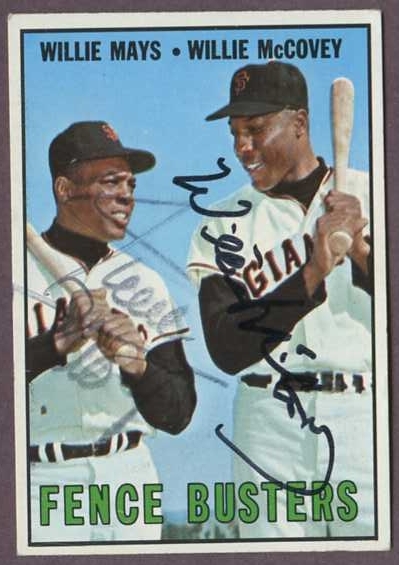 We are definitely glad someone took a trip to Candlestick Park and got these two sluggers' signatures. Please click here to view our entire selection of autographed cards.